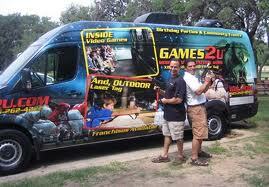 David Pikoff, co-founder of Games2U, launched the mobile video game theater franchise in Austin, TX in 2007. David will talk about how Games2U is quickly replacing "same-old" traditional birthday celebrations such as bowling, ice skating and pizza parties. He will discuss how he and Stuart came up with the idea for Games2U and what it is like working side by side with a sibling. David can also share their current strategies for helping to expand the business throughout the country. About Games2U - Games2U is transforming the video gaming and party industry. Founded in 2007 by brothers David and Stuart Pikoff, Games2U offers an interactive, state-of-the-art entertainment alternative for birthday, corporate and community gatherings. With parties starting at $199, the franchise is quickly becoming one of the hottest attractions at outdoor events and community and corporate gatherings.